The retiring Chair of an Edinburgh based Housing and Care charity believes anyone with a connection to the sector can benefit from making time to bond with care-users, family and staff as the industry faces tough challenges. Gerry O’Sullivan said the greatest enjoyment of his role was the chance to interact with everyone involved in providing high quality care to older people in Scotland. He called for senior managers to be more visible, leaving the office and making time to get out to see their staff and customers personally. “Visiting Bield’s housing developments and care homes for myself, and seeing the commitment, enthusiasm and passion of our tremendous staff – who provide great service, in sometimes challenging circumstances – has been enormously rewarding. “My visits have ranged from group trips to individual sessions and always provide inspiration and further insight into why we do what we do. “They can provide opportunities to chat with tenants, residents, service users and, on occasion, with family and carers. It is always clear that our services are highly valued and appreciated by the community where Bield has developments. Since becoming Chair in 2011, Bield said that Gerry has been a positive force in the organisation and played a key role in restructuring the Bield board and committee as well as continuing to work in partnership with other organisations, local authorities and agencies. Looking to the future, Gerry said he was optimistic about Bield’s ability to rise to the challenges facing the care and housing sector. “The availability of public finance remains a central factor in how Bield’s plans and manages its business and services – and indeed for every service provider. “Financial considerations mean that there are constraints around new build developments, modernisation and redevelopment of our existing properties, and the sustainability and viability of some services. “That is a day-to-day worry for everyone in the social care sector. “Bield’s strategy takes forward the achievements of the past five years and puts our customers – tenants, owners, residents and service users – at the heart of what we do. 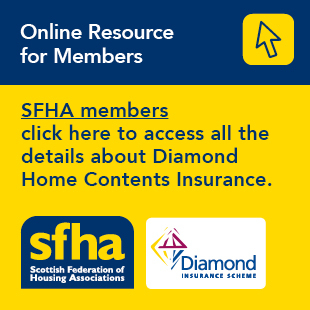 Though stepping down as Chair, Gerry will continue to play an active part as a Bield board member and as Chair of Scottish Federation of Housing Association’s Finance, Audit & Risk Committee. He concluded: “I have been very fortunate to work with an enthusiastic group of Board members, committed to Bield's ideals and strategy, led by Chief Executive Brian Logan.